Synergy Global Housing goes where its customers need us to be, and over the last few years we’ve heard our customers express a need for an enhanced presence in India.  This feedback pushed Synergy into action, and we are pleased to announce the opening of our newest Global Solutions Centre in Hyderabad, India. This is the 10th Global Solutions Centre for Synergy, and its second in the APAC region, with the Singapore Centre opening in 2014. While having a fully-operational office in India is important, it’s our people that make The Synergy Difference. 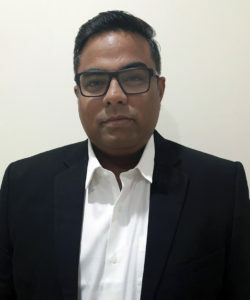 To guarantee Synergy can build upon the quality relations it already has in India, we’ve brought on Akshay Yadav, an India native with years of experience servicing the Relocation and Corporate Housing industries, to serve as a Global Account Manager and our first Hyderabad team member. Akshay’s knowledge and experience working with relocation, mobility and corporate stays in India made him a natural fit for Synergy. As part of his onboarding and training, Akshay visited Synergy’s Singapore Global Solutions Centre. Surprisingly, this business trip took him outside of India for the first time in this life. Leaving his home country gave Akshay a new perspective for someone with a decade’s worth of experience serving the travel needs of India’s business community. The business travel challenges started almost immediately after stepping off his plane. Because this was an international flight, Akshay needed to pass through immigrations and customs. But doing this, navigating the airport and managing his travel documents, became an adventure. 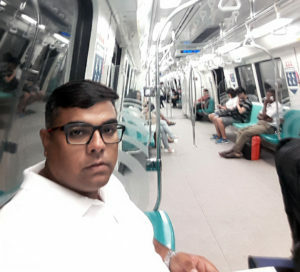 Akshay riding the MRT in Singapore. Once he finally got out of the airport, Akshay needed to get to his Singapore residence. He debated taking a taxi before deciding to use Singapore’s train-based MRT (mass rapid transit) system. He was pleased with his decision to take the train, as it gave him a better look at the city than simply taking a taxi directly to his temporary home. The train ride illustrated one of Akshay’s personal objectives of the trip, which was to fully embrace the Singapore experience. Other immersive activities for Akshay included walking through several shopping malls and eating at as many local restaurants as possible. Akshay initially found the local cuisine lacked flavor. Being an Indian, he prefers his meals on the spicier side, and couldn’t find the right amount of heat to match his appetite. That changed when he explored Singapore’s Little India neighborhood. Among his discoveries in Little India was the Mustafa Centre, a retail shopping mall specializing in Indian foods and goods. This was one of his favorite places to buy the groceries and home goods familiar in his hometown. Akshay recommends any Indian visiting Singapore should make the Mustafa Centre one of their first stops. It’s these types of recommendations that Synergy wants to encourage in all of our market experts – not just Akshay. Being on the road for business doesn’t mean you’re alone. Staying in a Synergy furnished apartment means you will always be supported by dedicated service team with experience resolving the unique challenges of international furnished housing. 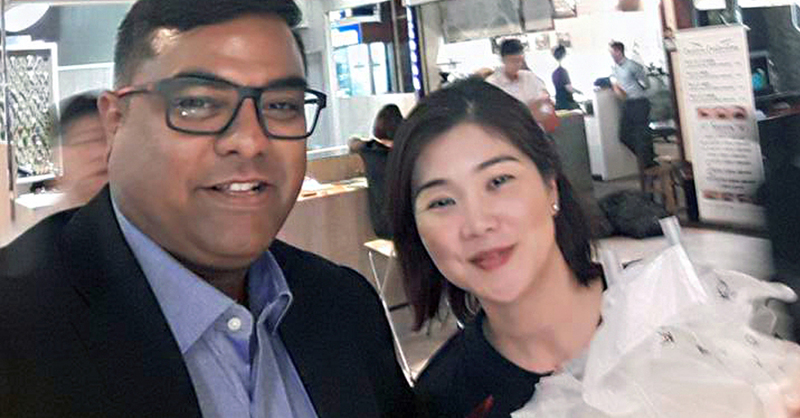 The Singapore trip allowed Akshay the opportunity to put himself in his guest’s shoes and see business travel from their perspective. He can now combine his knowledge of India with his experience as a global business traveler to better support his guests in the country. For more information on Synergy’s India offerings, please contact Akshay at +91 40 71055730.